Situated in the Hautes-Alpes, near the Italian border, Serre-Chevalier is one of the biggest ski resorts in Europe, comprising thirteen villages, including Briançon, Saint-Chaffrey-Chantemerle, La Salle les Alpes, and Monêtier les Bains. Serre-Chevalier is also beautiful and quite popular in the summer months, when travellers can enjoy a variety of outdoor activities like hiking and mountain biking. The scenery is spectacular, whatever the season, and it's easy to see why Serre-Chevalier is one of the most popular ski resorts in France. Serre-Chevalier is a very large resort, with more than 155 miles (250km) of connected pistes. There are a number of runs that will suit all levels of experience, with 23 green, 30 blue, 43 red and 15 black runs. There are an additional 28 miles (45km) of cross country trails. There is also a snowboard park in Monètier. There isn't much in the way of shopping in Serre-Chevalier other than the usual tourist shops and ski equipment stores. There are supermarkets and basic amenities like a post office, bureau de change and ATMs available. There are roughly 100 restaurants to choose from in Serre-Chevalier, ranging from fine dining to pizza and burgers. Serre-Chevalier has a relaxed and low-key nightlife, with a number of bars and one or two discos in Villeneuve and Chantemerle. 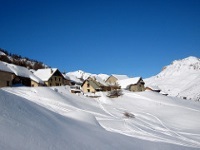 Like many ski resorts, there is a much livelier atmosphere in the winter ski season. Off the slopes there are a number of activities, including carriage and sleigh rides, ice skating, sledding, and taking advantage of the resorts' fitness centres and indoor swimming pools. Monêtier has a large thermal spa complex. In the summer, popular activities in Serre-Chevalier include hiking, canoeing, mountain biking, hang gliding, rock climbing and more. The resort operates four chairlifts in the summer for walkers and cyclists. Despite its size, Serre-Chevalier has a relatively quiet nightlife, so those looking for a wild party may be disappointed.